GreenUrbanScape Asia, the first dedicated urban greenery exhibition in Asia, opens today in Singapore until 9 November at the Singapore EXPO Convention and Exhibition Centre. Over 130 international brands from 19 countries will be exhibiting at GreenUrbanScape Asia, and they will be showcasing innovative solutions aimed at improving productivity in all aspects of landscape and urban greenery, including planning, design, construction and management. The inaugural event runs alongside the second edition of the International Skyrise Greenery Conference. Jointly organised by the National Parks Board (NParks), Landscape Industry Association Singapore (LIAS), Singapore Institute of Landscape Architects (SILA), and Singex Group, the three-day trade exhibition and conference will facilitate the sharing of ideas and solutions with a cross-section of industry stakeholders on a global platform. It is expected to attract over 4,000 participants, including 650 conference delegates and speakers from 25 countries around the world, making it the first time an event of such scale and range has been organised in Asia. GreenUrbanScape Asia 2013 was officially launched by Mr Desmond Lee, Minister of State for National Development. MOS Lee also presented awards to recipients of NParks’ Skyrise Greenery Awards 2013 and launched a new book entitled Vertical Garden City, Singapore. 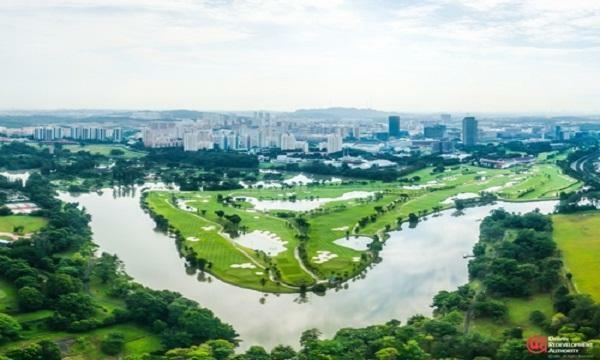 The book is published by NParks and the Urban Redevelopment Authority, and it describes the skyrise greening movement in Singapore, with profiles of selected projects in the city that exemplify innovation, creativity and the boldness to try new ideas.